When looking for a way to promote your business, these wrist lanyards will come in quite handy! 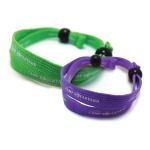 This classic promotional product has been redesigned to fit around your wrist " plus it features an adjuster for a custom fit. With your silkscreened imprint on the tubular knit polyester material the finished item is a perfect giveaway at tradeshows, conventions and healthcare events. Measures 3/8" in width and 17" long. I'm interested in learning about the Friendship Bracelet. Please contact me.